advantage. And while Adamson is a Municipal Economics 101 pretender- Councilor Adamson was chomping at the bit to shovel loads more of our hard earned tax dollars at Bill Oesterle's corporate welfare scam known as Angie's List and it was Adamson who excused away his acceptance of digital billboard special interest campaign donation payola while whining that "the fact is that political campaigns are expensive..."- I give Zach credit for finally discovering a spine when it comes to Greg Ballard's lies and this idiotic electric car scheme. No sensible person wanted that damned ACS/Xerox parking meter scam, no sensible person wanted the damn bicycle lanes, no sensible person wanted these freakin' electric rental cars.... and now no sensible voter wants Greg Ballard. Even more than Bill Hudnut learned, Ballard will soon spin in the wind by his lonesome, completely adrift from all the MCRCC "leaders", the crony attorneys and the campaign donation developers who bought him off to line their pockets. God Lord, how could we have twice elected as mayor such an ignorant human being? All that being said, where the hell are the other Councilors on this issue? I'd love to hear from at least one side of Jeff Miller's face. 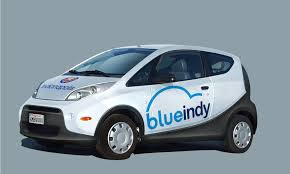 The Meter-Electric Car deal may totally violate Indiana Law. No problems though for the Crony Capitalists and those who carry the water for them. 1.) You must have a City-Council that is willing to stand up in a loud voice and tell Ballard - NO!!! 2.) You need a Media that will provide unbiased details and an investigation. 3.) Lastly you need a Prosecutor that will pursue wrong doing. We have none of these 3 elements here in Indianapolis. Flogger, you are right. When even the Democrat Councilors under the completely inept Maggie Lewis... who dresses as though her next stroll is on East Washington Street long about 1:30 a.m.... can't even stop our psychologically troubled mayor... things are damn bad. It's time to visit World sport park and judge your self $5M investment for cricket field - with no publicity, advertising or flyers from the City or the upcoming ICC Cricket event at the world sport park. Media and local public are not aware of this event like many other matters with cricket. City also constructing two more cricket fields at George Washington Park .. City is Spending much more on this sport cricket with no hope for any return from any usage by local cricket club or any events on all those four cricket fields. Does any one know maintenance /operating cost will be needed to keep this cricket fields - for many years to come. Anon 8:14- listen for the sound of crickets in answer to your questions.